Can a Board of Medicine Use the State’s Prescription Drug Database in Investigating Physician Actions? Can a Board of Medicine Use the State’s Prescription Drug Database in Investigating Physician Actions? Can a Board of Medicine Use the State’s Prescription Drug Database in Investigating Physician Actions? Can a Board of Medicine Use the State’s Prescription Drug Database in Investigating Physician Actions? Can a Board of Medicine Use the State’s Prescription Drug Database in Investigating Physician Actions? Can a Board of Medicine Use the State’s Prescription Drug Database in Investigating Physician Actions? Can a Board of Medicine Use the State’s Prescription Drug Database in Investigating Physician Actions? Can a Board of Medicine Use the State’s Prescription Drug Database in Investigating Physician Actions? Can a Board of Medicine Use the State’s Prescription Drug Database in Investigating Physician Actions? And where do patients' rights stand? According to a California appellate court, the California Board of Medicine can use a patient's record from the state's controlled substances drug database to build its case against a physician. But, on September 17, 2014, the California Supreme Court granted the appeal of the decision in Alwin Carl Lewis v. The Superior Court of Los Angeles County (Medical Board of California, Real Party in Interest), 226 Cal. App. 4th 933 (May 2014). Opening briefs on the merits are due to the Supreme Court of California by January 16, 2015. A few preliminary comments....The Medical Boards of each state wield enormous authority over the license of a physician. And this is understandable because the Boards are entrusted, in part, with protecting the public. The aggregation of data, whether it be through a controlled substances prescription database or big data analytics of the type being undertaken in the hunt for Medicare fraud, is empowering regulators and giving them a better understanding of physician practices as well as how the practices of the one physician compares to the practices of many physicians. Further, as we see a move towards the Interstate Medical Licensure Compact and the prospect of greater data sharing among the various Boards, the adverse findings of one Board of Medicine against a physician will surely impact the physician's licenses in other states. At the same time, based on the Appellate Court's description of the circumstances in this case, patients are left with very little choice or recourse with respect to the sharing of their controlled substances prescription records. As the Court described, the Board sent releases to six of Dr. Lewis's patients to obtain their medical records, but only obtained signed released from three of the patients. For two of the patients, the Board obtained the medical records after an administrative subpoena. (It's not clear what happened with the medical records of the sixth patient.) It is possible that the two patients whose records were subpoenaed did not provide releases because they, for whatever reason, did not want to participate in the process. Is it really proper for the Board to issue administrative subpoenas for the medical records of patients who (1) were not the ones that filed a complaint, (2) failed to return a release and therefore may not have wanted to participate in the process, particularly when three of Dr. Lewis's patients voluntarily released their records to the Board? Was the Board investigating the doctor or the patients? Moreover, there is no way for patients to opt-out of the prescription drug database programs--the only way patients can opt-out is to not fill their prescriptions. That doesn't seem like a true choice for patients. The case revolves around Dr. Alwin Carl Lewis. The investigation began in 2008 when one of Lewis's patients complained to the Board of Medicine (Board) regarding his advice that "she lose weight and start a diet that the [she] considered to be unhealthful." During the investigation, the Board ran reports on the provider's prescribing history in the Controlled Substance Utilization Review and Evaluation System (CURES) from November 1, 2005, through November 25, 2008, and from December 16, 2008, through December 16, 2009. After reviewing his history, the Board sent releases to six of Dr. Lewis's patients to obtain their medical records. Three of the patients signed the releases voluntarily, and the medical records for two other patients were obtained via an administrative subpoena. In its complaint against Dr. Lewis, the Board accused Dr. Lewis of a number of violations with respect to his treatment of the patient that filed the complaint as well as his treatment of the additional patients whose medical records were subpoenaed. After an eight day hearing, the Administrative Law Judge "concluded that Lewis engaged in unprofessional conduct by failing to maintain adequate records" with respect to the patient that filed the complaint and "that two of Lewis's patients had been overprescribed controlled substances during a short period of time." Dr. Lewis appealed the Board's decision to the trial court. Specifically, "Lewis argued the Board violated his patients' informational privacy rights under article I, section 1 of the California Constitution by accessing CURES during the course of an investigation unrelated to improper prescription practices, and also violated their rights not to be subjected to unwarranted searches and seizures." The trial court decided for the Board and Lewis then filed an appeal to the Appellate Court. [W]hether the Medical Board of California is permitted to conduct searches, without any showing of any kind-whether good cause, reasonable suspicion, or some other similar standard-and without warrant or subpoena-of the controlled substances prescription records of patients throughout the State, via the State's computerized Controlled Substance Utilization Review and Evaluation System. [T]he challenge to CURES appears to be based upon the protections of the Fourth Amendment, but Lewis makes clear that he is asserting his patients' right to informational privacy in their controlled substances prescription records. Lewis has standing to assert his patients' right to privacy under article I, section 1 of the California Constitution. . . Lewis's constitutional attack is narrowly focused on the Board's access to his patients' CURES data during an investigation unrelated to improper prescription practices without patient consent or prior judicial approval upon a showing of good cause. There is a diminished expectation of privacy in controlled substances prescription records maintained in CURES. Contrary to Lewis's contention, it does not follow that a patient's expectation of privacy in his or her controlled substances prescription records is the same as the expectation of privacy in medical records. 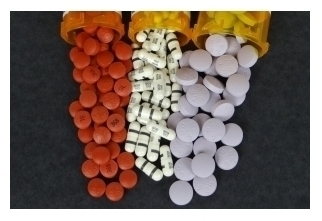 Unlike medical records, prescriptions of controlled substances are subject to regular scrutiny by law enforcement and regulatory agencies as part of the pervasive regulation of controlled substances. A reasonable patient filling a prescription for a controlled substance knows or should know that the state, which prohibits the distribution and use of such drugs without a prescription, will monitor the flow of these drugs from pharmacies to patients. Pharmacies are required to maintain records of prescriptions filled for controlled substances and present them to authorized officers of the law without a warrant. A pharmacist also has a statutory obligation to provide data of controlled substances prescriptions to the Department of Justice on a weekly basis for electronic monitoring in CURES. This well-known and long-established regulatory history significantly diminishes any reasonable expectation of privacy against the release of controlled substances prescription records to state, local, or federal agencies for purposes of criminal, civil, or disciplinary investigations. Further, the Appellate Court found that the Board's access to the CURES records for disciplinary purposes was permitted by statute and the Board has statutory obligations to maintain the privacy and security of the CURES records. Further, "there is no contention that the Board publicly disclosed Lewis's patients' information to third parties or failed to protect the confidentiality of the CURES data it received during the course of its investigation." As a result, "although there are no penalties in CURES for unwarranted public disclosure," given the other statutory protections in place, the fear that "the Board will publicly disclose CURES data obtained during the course of a licensee-physician investigation does not constitute a serious invasion of privacy." The Appellate Court also found that a warrant as dictated by the Fourth Amendment was not required because a "warrantless search of a 'closely regulated' business is deemed reasonable if certain criteria are met" and the criteria were met in this case because the CURES statute provided sufficient notice. Further, the statue places limits on the Board investigators because "[a]ccess to CURES data is limited to state and federal agencies for civil, criminal, and disciplinary purposes. Thus, under the statutory scheme, the physician and patient know who is authorized to receive CURES data and under what narrow circumstances." "protect[ing] the public against incompetent, impaired, or negligent physicians" and Board access prohibited doctors from stalling or otherwise impeding the Board from retrieving records when investigating the physicians. Further, the nature of the complaint against a physician should not stand to limit when the Board can access the CURES database because "a physician's prescribing practices are directly related to medical care and treatment afforded to his patients." As a result, the Appellate Court appears to conclude that access to CURES data is relevant in any Board investigation against a physician where a complaint is lodged. The Appellate Court found no violation of article I, section 1 of the California Constitution. Alwin Carl Lewis v. The Superior Court of Los Angeles County (Medical Board of California, Real Party in Interest), 226 Cal. App. 4th 933, 939. (May 2014). Id. at 948-49 (internal quotations and citations omitted). Id. at 949 - 951. 11/30/14 Can a Board of Medicine Use the State’s Prescription Drug Database in Investigating Physician Actions? 11/29/14 Under the Florida Telemedicine Rule, Can a Physical be Conducted by Telemedicine?